A turbulent week has ended in the Bitcoin markets, with prices on Bitstamp swinging repeatedly between $720 and $530. The previous week ended on a bearish note, with little expectations of a solution to the technical problems facing Mt.Gox. Indeed Mt.Gox made an announcement explaining the problem and indefinitely delaying the reinstatement of Bitcoin withdrawals from their exchange platform on Monday the 10th. This caused a great deal of panic in Mt.Gox users, and the price there has fallen steadily and considerably to the ~$250 levels as of today. In comparison, the price on Bitstamp has fallen a mere $90 to ~$610. Initially, the technical fallacies of Mt.Gox were also thought to be present in Bitstamp and other exchanges. This led to Bitstamp closing withdrawals from their platform temporarily, only to restart them on Friday, after making some fixes. 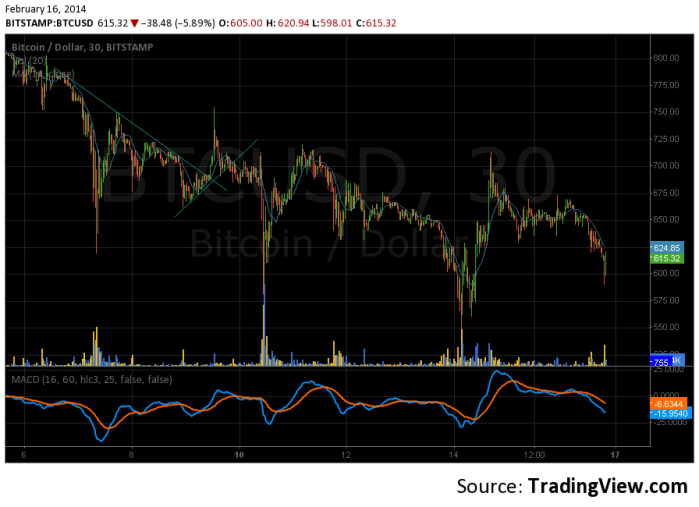 This has prevented a parallel fall in prices on Bitstamp during the past two days. The overall downtrend in prices on Bitstamp can be attributed to general misinformation on the transaction malleability issue which affected Mt.Gox, and also to some small scale (and very profitable) arbitrage between Mt.Gox and Bitstamp (taking place through the thriving open outcry exchanges on multiple forums). This weekend, Mt.Gox has left investors with a much needed update on their progress, and also promised to have a new announcement on Monday, with detailed news. This announcement apparently has not pacified Bitcoin investors, as the price on Mt.Gox continued to fall after it was published. It appears that only a clear announcement with a strict (and preferably short) timeline for restarting withdrawals is going to renew confidence in Mt.Gox. It’s anybody’s guess if the Monday update is going to deliver this to the investors. It is quite certain though, that there is not much downside remaining on Mt.Gox. High resistance is already being seen on Mt.Gox preventing the price from dropping below the mid-April peak of about $250. There is also very heavy resistance at every price level below $200, as we shall see many large eager buyers in this price range. All the price movements on Mt.Gox are unlikely to affect the price on Bitstamp and the other exchanges. Still, a strong uptrend is expected to start on all exchanges; both when Mt.Gox announces a restart in Bitcoin withdrawals, and when the withdrawals actually are restarted. This trend is likely to take the price till at least the original $800 level, where the price was very stable, and this will be a key level of resistance. Such an event would also cause the price discount on Mt.Gox to quickly reverse back into the price premium that was the norm until January. Extremely bad news from Mt.Gox, though unlikely at this stage, could still cause a further price drop in all exchanges, especially in Mt.Gox. There are many accusations of insolvency, insider trading, and fraud on the part of Mt.Gox, and at this stage; these still seem quite unlikely.